GoPro stock is getting hammered. We’re talking all-time lows, and investors dog-paddling away as fast as their furry limbs can propel them. To judge by the plunge in the company’s value, it would be easy for non-users to think GoPro cameras are crap. But they’re anything but. If anything, they’re better than ever – smaller, lighter, better resolution. The ubiquitous GoPro in action. They’re more than a match for any pretenders to the throne (in a future post, I’ll discuss how my old GoPro Hero stacks up against the shiny new Olfi One.Five action camera). Selina Wang, a writer for Bloomberg Technology, thinks she knows why: “Much like Fitbit trackers, many GoPro cameras are used a few times and then relegated to the junk drawer,” she wrote in her article “Can This Man Save GoPro?”. Wang is correct, but she completely whiffs on the big question as so many journalists do … why do they wind up in the junk drawer? It’s simple. People relegate their GoPro to the junk drawer because they’re so crap at using them. Their movies are so bad that, after a few tries, they bore even the person who makes them. Just go on YouTube and look at all the mind-numbingly boring footage: Fifteen-minute long mountain bike rambles with the camera in the Same.Damn.Position. People hiking (not exactly fast paced). 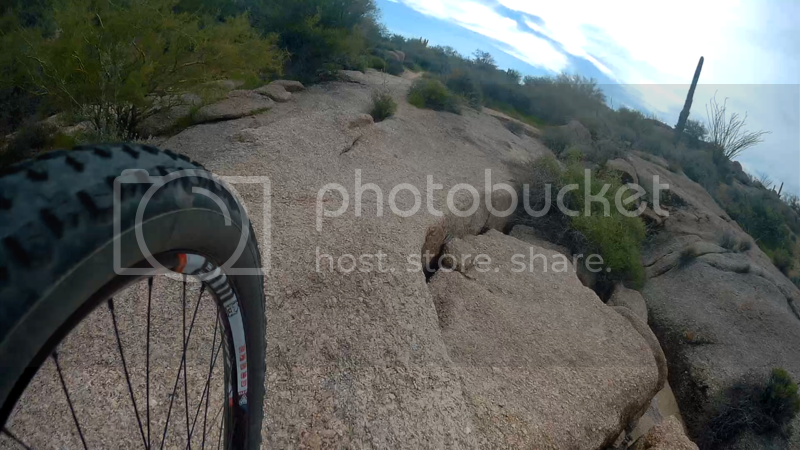 Clever use of accessories = more camera angles = better GoPro videos. If C.J. Prober, the new GoPro COO, wants to figure out how to raise the value of GoPro stock, I’ll offer him a few hints under this umbrella: The Karma is not going to save GoPro stock prices. If you want people to keep using the GoPro they bought, you have to teach them a little bit about how to make a movie. Just basic stuff, like have an actual point to the movie you make. Use it to tell a story. And vary your camera angles rather than plunking it onto your head and riding for three hours. Nobody wants to watch that – not even the filmmaker. Once they learn how to move their GoPro into different points of view, they need to about how to edit. Again, keep it simple … teach users how to keep their cuts short, what transitions look cool and how to find fair-use music. Speaking of editing, GoPro users can also take advantage of GoPro Studio, which is a pretty solid, simple piece of software. And it doesn’t play nice with non-GoPro video clips. That could be a big selling point. I’m leaving out a lot of possibilities, but that’s just so C.J. Prober can have his team add to my list before I hog all the good ideas. 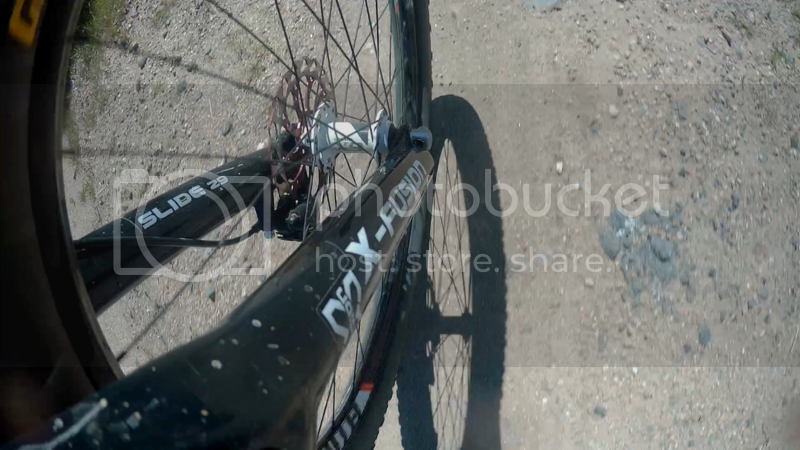 There are not many good options for mountain a GoPro on a suspension fork. Scratch the surface, and they reveal their limitations. GoPro needs to take the lead on this and other mountain issues. Create sport-specific accessory packages. For example, a good mountain bike kit would have mounts that can attach to not only helmets, handlebars and seatposts, but also to suspension forks and frame tubes. And put a reasonable price tag on the kits. Create a premium line of aluminum (rather than plastic) mounts. That will fend off encroachment from companies like K-Edge … who offer excellent but overpriced aluminum mounts. There is a nifty cottage industry for aluminum GoPro-compatible mounts. Some are awesome, some are crap. Who wouldn’t prefer to go straight to the source if they offer great, reasonably priced accessories? Create content that showcases how to get creative with these kits. Some how-to instruction taking people from the myriad camera angles to editing tips will get GoPro owners to have more fun using their stuff. I’d be the first to share a few ideas. And here’s a fun concept – break down a few great introductions from movies and show how a GoPro user can use the same concepts in their own action sports film. Create content that shows the best innovations from everyday GoPro users, whether they’re using approved branded gear … or paracord, duct tape or zip ties. Capturing a cool moment with a GoPro. An an ideal world, I’d have three action cameras mounted at various locations, all with ball-swivel mounts (and I know how bad that sounds, giggity). They would be small. They would be cheap. They would be simple … as in no battery-sucking LCD screen. They would be operated from a single handlebar-mounted remote. Just maybe they would wirelessly store their footage on a single central unit. The complete system would be around $300. This will motivate people to get their GoPro out of the junk drawer. It will get them buying accessories and using their GoPro enough to wear it out and upgrade. When that happens, watch for GoPro stock to climb out of the toilet, shake off the excess water, towel off and start to climb again. Previous When Should You Get a New Mountain Bike?